The rabit has been in complete action mode since seven o’clock this morning and he brought our breakfast to us even before Aitana could begin her tiresome braying. I have no idea why she does all that dramatic braying: I have observed these arrangements for five years and food always comes whether you bray for it or not. The braying is also a bad example for Morris who has now started joining in. By the way, I never bray. It’s not that I forgot how to do it, or I never learned: I could bray if I want but I can’t quite see the point. It’s an awful noise and it gives me a headache. After the rabit had given us our breakfast he returned with his wheelbarrow full of woodworking tools and he cordoned off my new house again. The rabit’s main holiday project was to make the stable bigger, as my foal Morris and that stroppy little madam Aitana are now nearly four years old and are getting quite big. Morris is becoming quite muscular with a fine strong neck and powerful legs. Aitana is just overweight. Why the rabit calls her his “pretty little donk”, I have no idea. She’s just a stroppy little fat horse as far as I can see. Here I am in my new house. The rabit has put new stalls in the stable so we can have our own places and I have claimed this as my own little house. If I simply stand here most of the day, the others will eventually see that this is my house. Not their house. My house, because I am standing in it. Nobody else’s house. I have chased out Matilde and her norty foal Aitana. If Morris is sensible he can come in and stand in my house for a short while. Any silliness and I will chase him out. The rabit appeared with his Black & Decker cordless drill, intending some final modifications, but I chased him out too. I am quite happy with my house as it is. I don’t want any modifications. Finally, I see there was some speculation about Morris sticking his tongue out, in an earlier blog post this week. There is no mystery about this. Morris pokes his tongue out because he is a rood donkey. The solution is to creep up behind him and bite his leg. That stops him poking his tongue out. It is the rabit’s last Tuesday before he goes back to work next week, so it is thankfully the last Tuesday when he will be flying about drilling and hammering, so I can have a quiet Tuesday next week when he is back in his classroom panicking about Schemes of Work for Key Stage 3 Geography. 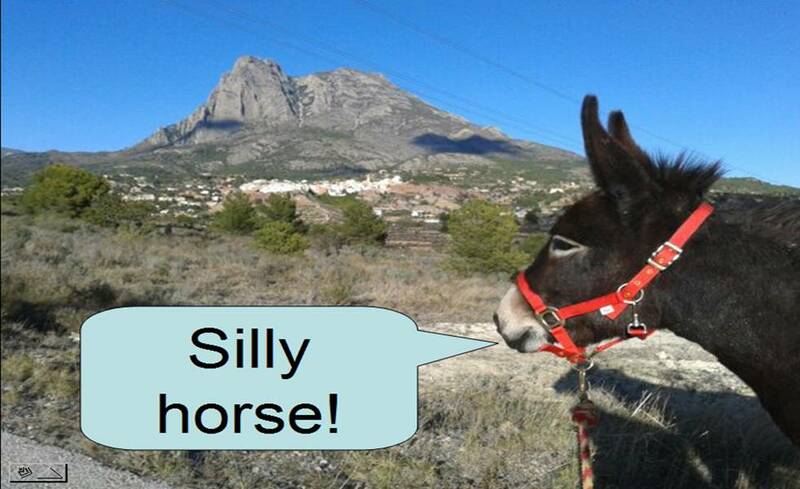 For the rest of my Tuesday thinking day today, I shall think about Costa Blanca property values, and try to estimate how much my stable is actually worth. Why does Morris stick his tongue out? Perhaps the braying has less to do with food and more to do with a cold mug of beer. In the morning Matilde and Aitana watch the house like hawks. Rubí and Morris are more relaxed: they know that food will arrive. I try not to open the door until I’m ready to go down to the field, as the sight of the open door just increases the wild braying, which is mostly due to Aitana, encouraged by Matilde who stands there staring at the house and making low moaning noises – as if dying of hunger! The curious thing is, Aitana is usually first to lose interest and walk away, once they’ve all been given their food! 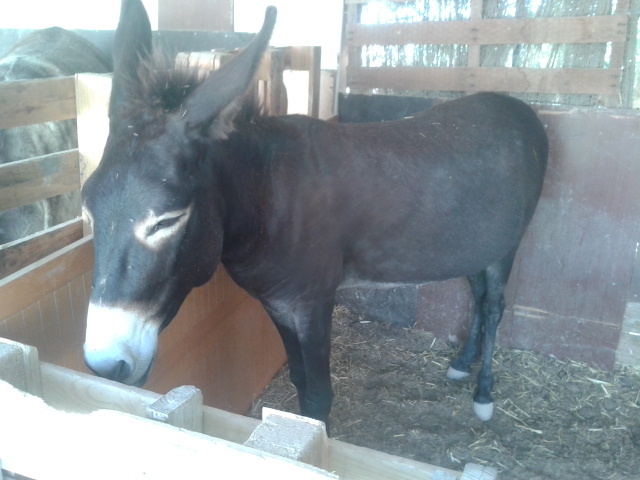 Our Trooper has a solution for braying for food, when he wants attention of any sort (carrots, hay, a rubdown etc.) he just bangs the door of the stall with his hoof. Bang bang bang! I’ve counted up to 12 times, repeat as necessary… They are both fat and obviously not starving at all. clementine does not bang as she is more ladylike and lets Trooper do the work. the other day I had some small apples for them. Trooper was a distance away, and when I gave one to Clemmie he came trotting down for his, and she body-blocked him! and bit him on the shoulder when he persisted. Eventually I was able to give him his apple. Such characters!